Anekal is a major town and taluk of Bangalore Urban district. Approximately 32 km from Bangalore Centre and around 15 km from Hosur and Electronics City. Express lines run from Silk Board to Anekal passing through the National Highway and SH broadway thus providing excellent connectivity. It lies in the southern part of the Bangalore metropolitan area. Anekal is known for the karaga and Dasara festivals. It is a growing hub for residence seekers in Bangalore and is perfectly positioned with great infrastructure and facilities. Multiple Industrial areas like Attibele, Sarjapura and Jigani lie in Anekal Taluk and contribute to major economic turnovers. Major MNCs and IT-BT companies like Infosys, Biocon, Wipro, HCL, TCS, Accenture and so on are all part of Anekal Taluk. Kannada is the most widely spoken language in Anekal. Other languages include Telugu, Tamil, Hindi and Marwari. The population has more nearly doubled since 2011 with growing business opportunities. Bangalore Metropolitan Transport Corporation (BMTC) operates 4 Depots in Anekal Taluk and Karnataka State Road Transport Corporation (KSRTC) operates one Bus Depot providing excellent connectivity. Anekal is located at 12.7°N 77.7°E﻿ / 12.7; 77.7. It has an average elevation of 915 metres (3001 feet). As of 2011 India census, Anekal had a population of 44,260. Males constitute 52 percent of the population and females 48 percent. Anekal has an average literacy rate of 67 percent, higher than the national average of 59.5 percent, with 56 percent of the males and 44 percent of females literate. 12 percent of the population is under 6 years of age. Anekal in Kannada translates to 'Elephant rock'. 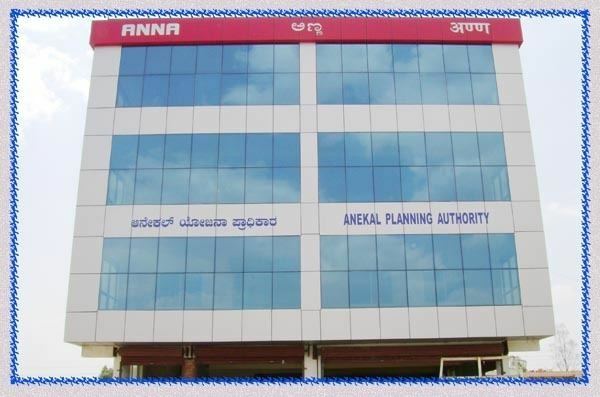 Anekal is one of the growing towns around Bangalore urban district, situated close to major economic sites like Electronic City, Jigani and Hosur. Muthyala Maduvu also known as Pearl Valley is a major tourist spot just a few km from the town and attracts tourists from all over the state. Anekal is also known for its Silk industry and is home to a number of skilled weavers. Sri Thimmarayaswamy temple located at Anekal is well known for fair and Karaga Utsava. Kambada Ganesha temple located in the town center, is well known for its monolithic statue of Lord Ganesha on a long pillar. Sri Amrutha Mallikarjuneshwara and Sri Bhramarambika temple are one of the many historical temples located in the town.